Perfect Square and the makers of Bravest Warriors have teamed up to bring us two new hardcover books aimed at young readers — though grown-up fans of that Internet phenomenon are certain to find some surreal and interesting stuff as well. The star of it all? Catbug, “everyone’s favorite dimension-hopping adventurer”. 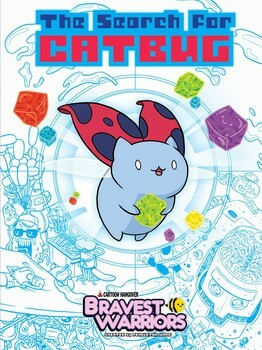 In The Search for Catbug, we find that “Catbug ate some weird new cubes of food that caused him to lose what little control he already had over his jump abilities! Now he’s careening through dimensions, unable to stop! Help the Bravest Warriors travel the galaxy and find Catbug. Just don’t eat any of those cube snacks or you might end up lost too!” Simon & Schuster have a web site for it too. Meanwhile in Catbug’s Treasure Book “…we see the world from his perspective. A kind of scrapbook, the pages are filled with memories and souvenirs of his adventures with the Bravest Warriors, along with his playtime imaginings. There are also allusions to past episodes (Danny’s eyebrows taped to a page, for example), and hints at secrets not yet revealed.” We found this one over at Booksamillion.